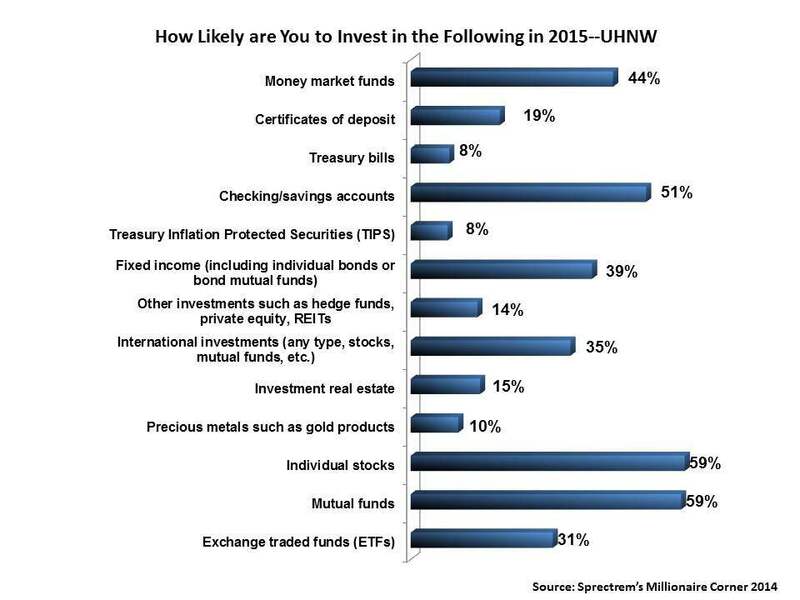 Ultra High Net Worth investors put great stock in their financial knowledge and investment acumen. One-third identify themselves as self-directed investors, meaning they make all financial and investment decisions without consulting a financial advisor, according to wealth level research conducted by Spectrem Group of households with a net worth between $5 million and $24.9 million. These investors rank smart investing just below hard work and education as the primary factors to which they attribute their financial success. How do they intend to invest in 2015? A recent survey of investment preferences among Ultra High Net Worth investors finds a more cautious mindset that finds an equal percentage indicating they are most likely to invest in mutual funds as they will stocks (59 percent) with 51 percent saying they will be investing more assets in their checking/savings accounts. Forty-four percent said they plan to invest in money market funds this year, while 39 percent indicated they will invest in fixed income products such as bonds. The New Year has done little to ease their reticent investment mindset. On Wednesday, the day after the Dow Jones industrial average’s worst one-day point drop in five months, stocks fell slightly lower on uncertainty over when the Federal Reserve will hike interest rates as well as concerns over the dollar’s gain on the euro. Concerns over global political instability as well as heightened terrorism fears following the massacre in Paris staged at the offices of satirical magazine Charlie Hebdo and continued reports of atrocities committed by ISIS and Boko Haram have also cooled interest in investment overseas. The highest percentage of Ultra High Net Worth investors (44 percent) said they had no interest in investing outside of the United States. Of those that do, the one-fourth (26 percent) indicated they would be most likely to invest in Europe. This is up from 13 percent in 2011. China (along with Canada) is the country Ultra High Net Worth investors are next most likely to invest in but enthusiasm has waned since 2011 when 27 percent said they would be most likely to invest in China. Baby Boomers ages 55-64 have the most interest in China (26 percent), the world’s second biggest economy. Of Ultra High Net Worth investors indicating an interest in investing in Japan, the world’s third-largest economy, the highest percentage (17 percent) were the youngest surveyed (ages 42 and under). A scant three percent of these elite investors overall said they will invest in Russia this year. Technology stocks continue to be the most attractive sector to Ultra High Net Worth investors, Spectrem Group research finds. For the fifth consecutive year, the highest percentage (59 percent) indicates that technology is the sector in which they will most likely invest. This is up from 50 percentage points from 2013. There is also growing interest among Millionaire investors in the healthcare sector (53 percent, up from 51 percent in 2013) and pharmaceuticals (49 percent, up from 41 percent).